This is the perfect accessory for the "road warrior". It converts your automobile 12 DC to 110V AC and also provides a 5V DC USB port to power USB devices. It's perfect for keeping your laptop charged or charging any USB powered device You can use this in the car, truck, boat, SUB or RV. It includes an internal cooling fan. Comments: Don't try to run a serious appliance using this device! 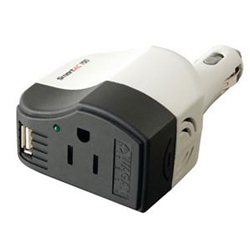 It is rated for 90 watts, which is within the range of most small electronic devices including your laptop charger. But check out your device wattage before ordering or using this product. Beyond this limitation, it is simple, mounts firmly to any automobile 12V socket, and works perfectly. The main problem we have with stocking this item is that invariably one of the kids (grown up kids) are stealing these from our stock for their personal use!